Description: Announce the arrival of your little one with Tag & Co. signature baby collection. 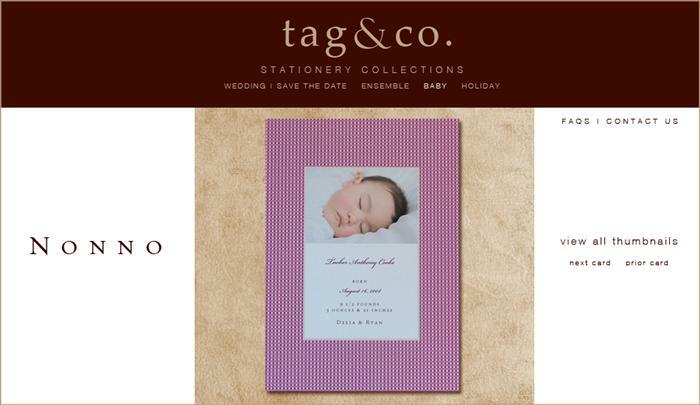 Tag & Co. has a diverse range of offerings which are exceptionally flexible and can be utilized for events ranging from Baby Announcements, Shower Invitations and Party Invitations. These unique designs combine elements of modern design with vintage classicism and when paired with the beautiful, thick cardstocks results in a truly distinctive invitation or announcement. You can change the colors, backgrounds or images, paper stocks/sizes and then add a picture of your new little one (e-mail your digital picture or send us a hard copy and we will scan it). Truly flexible, these designs will be unique to you. An electronic proof is usually sent within 48 hours and the finished product is usually shipped out 7-10 days after proof approval. Call or e-mail to make an appointment to see all designs and to better envision the changes that can be made to make your design unique. Pricing: 40-100 cards (card and envelope set) are $3.00 each (includes color changes, photos and proofs).